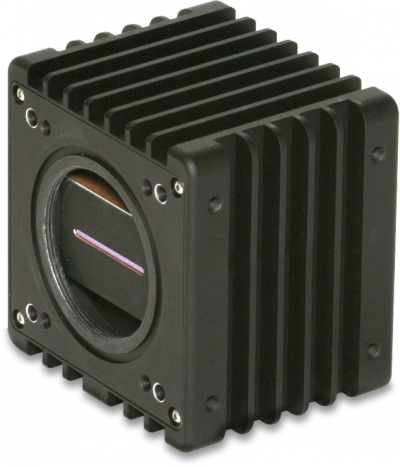 The SU1024LDH2 is a 2nd generation high-speed 1024-pixel linescan InGaAs camera that increases the A-line rate to 91,911 lines per second. The SU1024LDH2 is a 2nd generation high-speed 1024-pixel linescan InGaAs camera that increases the A-line rate to 91,911 lines per second. This enables spectral-domain optical coherence tomography (SD-OCT) at 1.04 μm to capture detailed 3-D volumes of the retina, nerve head and choroid layer in a blink of the eye. For 1.31 μm SD-OCT, diodearray based OCT systems offer superior phase stability for Doppler or Polarization-Sensitive OCT. The LDH2 provides 12-bit digital capture into base-format Camera Link® interface cards, while providing maximum dynamic range up over 2300:1 for high line rates. Two pixel apertures are available: 500-μm tall pixels for easy alignment in SD-OCT systems, or 25-μm square pixels for ultra-fast machine vision or dual-camera PS-OCT.
2Accessory Kits: Include power supply, carrying case, SMA-BNC trigger in and sync out cables, o-ring, carrying case, mini-CD with manual and free SUI Image. Analysis software for National Instruments Camera Link frame grabbers.